We arrived in Scottsdale and the Talking Stick Resort & Casino on Thursday mid-day for the big Seahawks game and birthday gathering of our friend, Becky Kelly. We opted to stay in the hotel and park the MoHo in the lot, which was a nice treat for us. This was a very nice resort and reminded us a lot of Tulalip back home. There was a group of 12 of us, so we had shuttles organized to take us to the game. The guys got in one van and the gals in the other. Not sure what happened, but the guys made it to the stadium in 45 min’s whereas our genius driver got us there in a record 2 hours 15 mins. Obviously he went the wrong way smack dab into traffic. It wouldn’t have been that big of a deal, except one of the guys had all of the tickets. Two of the guys waited outside for us to arrive, which was so nice. We ended up missing the 1st quarter which was a bummer. Finally made it in the stadium to find out our tickets were in the family section (no alcohol). Are you kidding me?! Regardless of these snafus the game was awesome and the Seattle 12th man presence was huge! It was a great win and pretty fun to be there to witness. The shuttles back to the hotel went a bit more smoothly! The next morning, Mike & I played golf with some of the group. Thankfully we teed off early, as it was pretty toasty by the time we got off the course. We headed back to the hotel for some R & R before the big birthday dinner in old town Scottsdale. We ate at the coolest restaurant, Olive & Ivy. We sat outside on the patio and I had one of the best meals I have had in a long time! Delicious and very reasonable. After dinner the party continued to a few bars in Scottsdale, then back to the hotel. 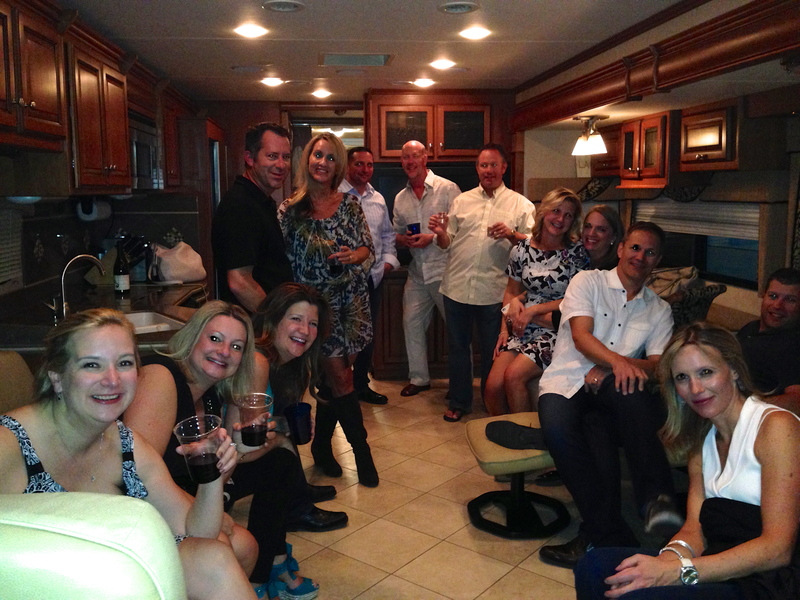 We stopped off at the MoHo for the group to see our home on wheels and ended up having a dance party in there with 14 people (that’s a record)! Only interrupted by the hotel security “encouraging” us to take the party inside. We headed up to the hotel nightclub for more celebrating. Mike & I went to bed early at 1:30am but the youngsters stayed up until who knows when. Thank you to the group for including us in the party. It is so fun to see friends along the way! 14 people in the MoHo! Saturday morning we were up and out of the hotel by 9:30 to stay with our friends, Vickie & Bruce Cline, who were down from Seattle at their house in Sun City. 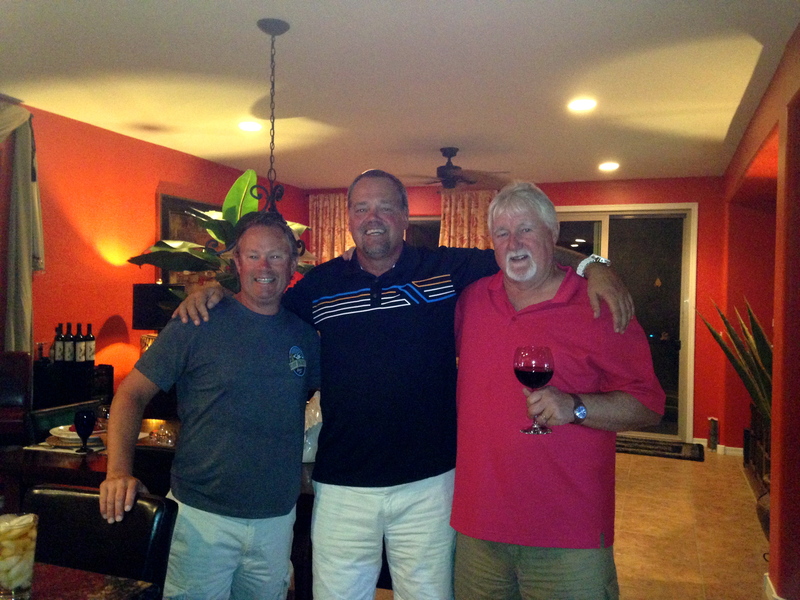 We were able to park the MoHo at their home association clubhouse and stay in their house. They had another couple, Steve & Jolene, visiting as well. The Husky football game at ASU was on the agenda today. I was outnumbered 5 to 1, them in their purple and gold and me in my neutral colors. Off to Tempe we went! The streets around the stadium were packed with fun bars and restaurants with outdoor areas, misters for relief from the heat and loud music playing. What a fun, college atmosphere. There were A LOT of husky fans there, which was pretty impressive. Our seats were in direct sun for the whole first half which was a bit brutal, but the shade came over us for the second half, which was a much-needed reprieve. 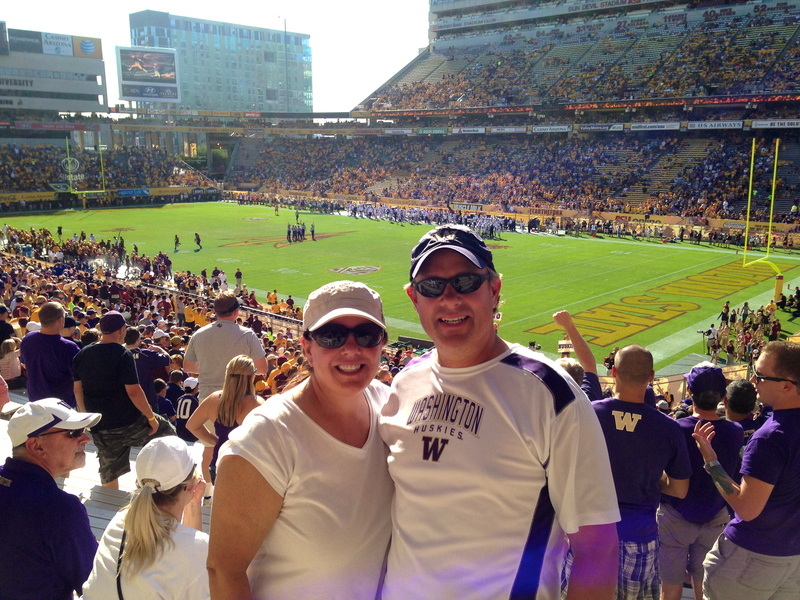 The Huskies were horrible and in the words of my husband, didn’t even show up for the game. This was a great place to come watch college football and I would love to return for a game in the future. Back to the house for a relaxing evening. Oh, the Cougs also lost to Oregon, no surprise. The next three days were wonderful and relaxing! Mike played golf with the boys one morning. We drove into Cave Creek for the day and a great Mexican dinner. There was also a “Bike-toberfest” event going on there. Hundreds of pristine Harleys and lots of decked out biker guys & gals. We stopped in at the main hub, the Hideaway, for a few beers before dinner and to people watch. We all stuck out like sore thumbs since we weren’t in black or leather. It was fun up until the point where Bruce had his wallet stolen. Not much cash lost, but as we all know, such a hassle to have to cancel everything. Kind of put a damper on things, but Bruce was pretty even-keeled about it. The next few days we hung out poolside, kayaked on the lake that their house sits on, Mike fished for hours and we cooked some darn good dinners, enjoyed great wine and loved hanging out with good friends. Thank you, thank you, thank you to Bruce & Vickie for opening up their home to us! On Wednesday, they were off to the airport for their flight back to Seattle and Mike & I continued our visiting of friends. We drove 15 minutes west to Surprise, AZ and the Sunflower RV Park. This was an over 55 resort, but they made an exception for us! 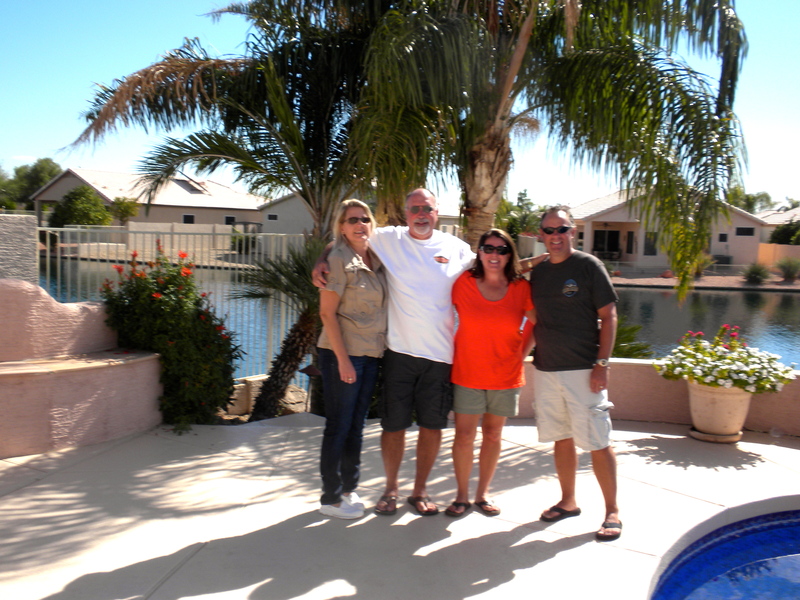 This was our home base for our visit with Bob & Gloria Woolsey, Mike’s former employers and now close friends. They have a beautiful home in Buckeye. We got settled then headed out to their house for dinner. Another friend who used to work with the group was also there, Brad Wallace. They made us a delicious home-cooked meal and we had a great time catching up talking about old times. Bob & Gloria were a bit of an inspiration for us with what we are doing. They bought a 40-foot MoHo over a year ago and have been doing a variety of trips. We visited them when they were in the Seattle area and toured their rig. This was in the early stages of our planning so seeing how they were doing it and talking through the lifestyle change with them proved to be invaluable. They have really been great supporters of what we are doing. We returned to the MoHo that night for a great night sleep in our own bed after being out of it for almost a week. The next morning, we headed back to their house for a five-star breakfast and more fun catching up. Mike & I had errands to run for the day, but they came down to “our house” for dinner that night. We ordered pizza and sat outside and watched the baseball game. Really, really great to see them and spend time together! Next we are heading north to Sedona and the Grand Canyon! 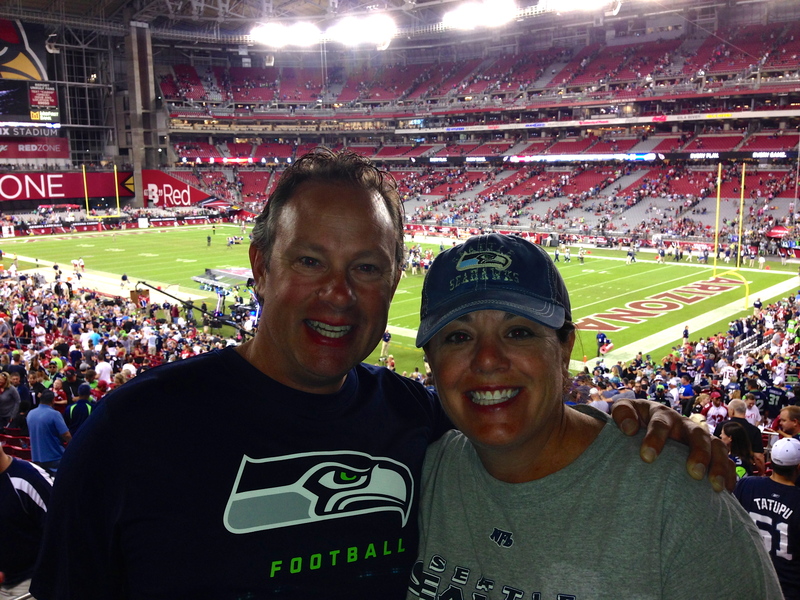 This entry was posted in October 2013 and tagged 12th man, Cave Creek Arizona, Football, Huskies, Scottsdale, Seahawks on October 25, 2013 by Traci.